As part of my blogiversary celebration, Judy Kirby, author of The Golden Pickle, sent me her CD to review (and giveaway!!). Her company makes an audio CD for children called “The Golden Pickle” and it is full of stories that she told to her own children when they were young. A little bit about the CD. The CD has stories mixed with riddles and rhymes from traditional children’s lore. The stories have 2 main characters “A Pirate Boy” and “A Balloon Girl”. Most stories feature one main character or the other. In each story, The Pirate Boy or The Balloon Girl are in search of a “Golden Pickle.” Interspersed between the stories are riddles and rhymes targeted at children. Once upon a time there was a boy. A pirate boy. And he had a ship. A pirate ship with monkeys. A hundred pirate monkeys with banana swords. 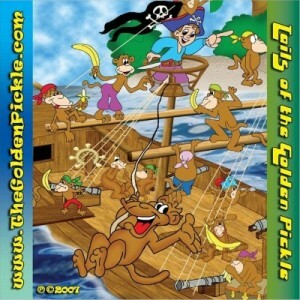 The Pirate boy was looking for a golden pickle. Just like every other day. One day, I decided to just start playing the CD while my son was playing. The first time I did it he was too busy and he didn’t pay attention. I was playing it on my computer. But the second time I did it, I put the CD into our DVD player while my son was playing in the living room so that the sound actually came out of our TV. Within minutes, my son was sitting next to me on the couch “watching” the blank TV while we listened to the stories on the CD. He was giggling and asking questions and really getting into the story! Did you notice that my son asked to “watch” the stories over and over? Maybe it was his limited four-year old vocabulary, but I actually think he “saw” the story unfold in his mind. To him, we were watching the Pirate Boy and his band of monkeys or the the Balloon Girl and her friends the baboons! We listened to the entire CD and at the end he asked to listen to the very first story again! My son doesn’t even get this engrossed by movies! I was stunned and so pleased! It was fun to sit on the couch and snuggle up under the blanket with my son and listen to these wonderful stories. And watch his expressions. He really “lived” the stories. And I enjoyed the time it gave us together giggling and listening. And if you have a daughter, she will easily connect with the stories focused on the Balloon Girl. This CD was a life-saver when we took our 12 hour flight to Hawaii just recently – my son listened to it and it kept him occupied for at least an hour on the flight! And there aren’t many things that can keep a 4 year old occupied for a whole hour!! This CD has something for every child – from toddler hood, through preschool and beyond – for boys and for girls! Don’t be surprised if your little one starts their own quest to find the Golden Pickle! Would I change anything? There is always something you’d change right? Remember how I mentioned about the riddles and rhymes that are interspersed between the stories? Well, for my son’s age group (age 4), I would get rid of them. Maybe when he is older he might enjoy them more, but we basically just skipped over them and went on to listen to the next story. The only other thing I would change would be to list on the CD cover which stories feature which characters. My son often asked for “the one with the Pirate boy” or the “one with both the boy and the girl” and I had a heck of a time figuring out which one he wanted to hear! All in all – I was pleasantly surprised by how much my son enjoyed this CD. We will definitely be in line when the sequel comes out!! One lucky winner will be chosen by random draw – so spread the word. You can get extra entries to win by tweeting, facebooking, myspacing or blogging about this contest. Leave a separate comment for each activity. You may enter for each activity once per day. Do you want to get a preview of this CD? It is available on iTunes! Purchase an iTunes story for your child and you will get 5 extra chances to win the whole CD – be sure to come back here and leave us a comment with your order number!! This contest ends 11/22/09 at 5 PM. All entrants will be verified and must complete the mandatory entry before completing the ‘extra’ entries. Invalid entries will be disqualified. This contest is open to people with US mailing addresses only. Winner must respond to email within 48 hours or we reserve the right to choose another winner. Disclaimer: We received a complementary CD to evaluate as part of this review. This gift enabled us to properly review this product and did not affect the objective nature of our review. My daughter is 3.5 years old. Her favorite story right now is Snow White…or any princess story. My son is 6 months old and his favorite story is Brown Bear, What Do You See? by Bill Martin Jr.
My son is turning 2 this weekend and his favorite book is The Little Red Caboose (A Little Golden Book). He asks for me to read his ” ‘boose book” over and over. .-= Andrea Kruse´s last blog ..Bread anyone? =-. .-= Megan´s last blog ..Random Tuesday Thoughts – My life =-. .-= boobiesnbabies´s last blog ..BoobiesNBabies: rt @MommyNews Giveaways and contest for expecting moms, breastfeeding moms and kids (via @Greenparenting) http://bit.ly/12kPiB, pls RT =-. My daughter will be two on 11/25 (day before Thanksgiving) and her favorite story is anything from Disney especially with Ariel. We read Ariel’s Deep Sea Adventure every night! .-= Katie´s last blog ..Locked Out =-. My daugther is 2 and her favorite book is Shake it Up, Baby. My granddaughter is 3 she likes the story GRANDMA,Grandpa AND ME.